There is not much to say so I won’t take up much time or space with this post. Roger struggled and he played very poorly, sloppy, erratic, fill in your words of choice here..it was sad to watch. 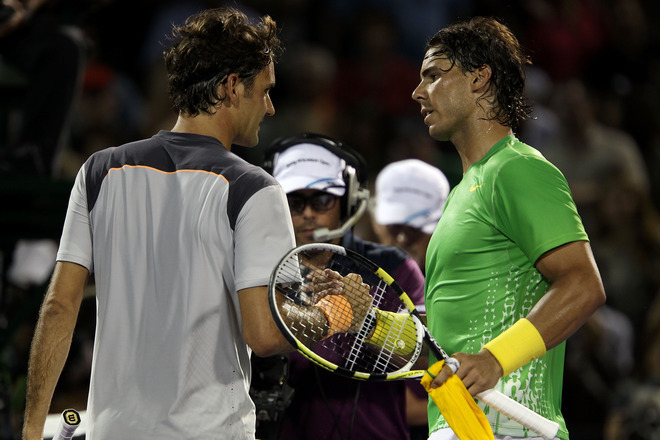 Rafa Nadal played his game and advances to the final with a 6-3 6-2 win tonight. He will play Novak Djokovic in the final, who easily defeated Mardy Fish 6-4 6-1. Check out the Miami 2011 album at FF07 on Facebook while adding the sister page, FedererFan ZeroSeven to your Facebook profile to enable Facebook chat. With nothing left to say, enjoy your weekend amidst this depressing Federer loss and lets try to look forward to something good in the clay court season and beyond. FF07 is FedererFan07, the best Federer fan site on the web.